Generally one of the most utilized rooms in the home, the bathroom is required to pack a big punch in a fairly compact space. It’s a place for preparation, relaxation and rejuvenation; a chance to form your very own private oasis. The bathroom sets the tone for how we start and end each day. When you look at it that way, it seems pretty important, and since a good remodel will only set you back tens of thousands of dollars, it also seems…doable. There are several types of bathroom spaces, but today we will be referring primarily to the master. (However, a bath is a bath and many of these tips still apply). Let’s start with the vanities. If you have enough room for two vanities, great! His and hers means less time spent grossing out over your husband’s beard trimmings and sad globs of toothpaste. If you have even more room, consider adding a makeup area. This will be a slightly lower countertop (30”) than the vanity itself (36”), and should be at least 27-30” wide, for comfort. Now, if you’re like me, and you’ve been standing to put on your make up your entire life, the thought of a sit-down space may seem pointless, but remember, you can also do hair here. My standard vanity will have two shallow drawers in the center directly above the knee space, then two drawers on either side. I give the bottom outside drawers slightly more depth than the top, allowing for special compartments that house my straightener, curling iron etc. This keeps all of the cords neat and tidy. And why two drawers in the center you ask? It’s my experience that two things happen with a 30” wide single drawer- 1) it gets incredibly messy, too many items sloshing around in such a big space and 2) in order to reach the items at the back, the drawer must be fully extended, which means you and your chair have to get out of the way. Instead, with two small drawers, you can simply swivel to one side and pull the drawer out past you to access the back. There are some great drawer inserts on the market today with small divides for items like make up, hair pins and ties etc. Also, look for adjustable, modular sets so you can modify as needed. The layout of the main vanity will require slightly more thought, as you’re working around the plumbing, specifically the p-trap. The p-trap is the pipe that drains the water from the sink into the wall behind the vanity. Directly below the sink, I would recommend a central “fixed” drawer, meaning non-functional, and a set of doors. This will maximize your usable storage area, allowing you to place items around the p-trap. Baskets are a great way to keep items wrangled in the awkward cut out space. When it comes to sink in the master, keep it simple. Do not be tempted by the vessel or “bowl” sinks. While beautiful, they’re a cleaning nightmare. Do yourself a favor and select a deep, generously-sized under-mount sink, and leave the vessels to the powder bath. Those art-like pieces are more suitable for areas that aren’t utilized on a daily basis, because there will be a lot of splashing. Splashing when you wash your hands, splashing when you wash your face, brush your teeth etc. And it’s not only splashing you have to worry about. That splashed water then collects in that hard to reach crevice where the bottom of the bowl meets the counter. Soap scum and other nasties can be found here as well,, because let’s be honest, nobody cleans their vanity every time they use it. You’ll have plenty of opportunity to create a stunning master bath, the sink does not need to be a focal point. For some added pizzazz, consider a wall mount faucet instead of the standard deck mount. Again, avoid fixtures with tiny crevices for ease of cleanliness. Also, if you live in a place with hard water, stray away from the “waterfall” fixtures. While gorgeous in the beginning, the hard water will eventually leave a white, hard water residue that is very unsightly and hard to remove. When considering a mirror for this area, remember that you need a minimum 4” backsplash of some sort behind the sink to protect the wall from splashing. This can either be done in the same material as the countertop, or you can mix it up with a coordinating tile. If you have a smaller space, maximizing your useable mirror area is important. Choose a mirror with a smaller frame width, or skip the frame all together. Frameless mirrors always look best in areas where there is vanity is surrounded by walls or cabinetry on either side. This allows a place for the raw edges of the mirror to “die” into. An exposed side of a frameless mirror isn’t always the most attractive. If you have high ceilings, running the mirror all the way to the top may look strange and out of proportion to the room. Consider a fur down in the ceiling to shorten the gap. This is a boxed area of drywall that protrudes about 12-18” from the back wall above the vanity. Add recessed cans here to help illuminate the vanity and cast a nice glow against the mirror. Sconces are also a great source of light, especially for make up application. These can either be placed directly onto the mirror, or situated on a wall between mirrors. Placing the sconce directly on the mirror is a trick designers use to help bounce more light around the space, which makes it feel larger. This can be done in other areas of the home as well, like the dining room, for example. Add a mirror at the right height to showcase the chandelier above the table, you’ll be amazed how much bigger and brighter it will become! Moving around the space to the shower area. The type and number of plumbing fixtures required in this space is dependent on two things, size and functionality. If your shower is six feet or longer in length, consider using multiple shower heads. By code, bathroom fixtures have an eco-friendly, conservation restriction that only allows them to push out so many gallons of water per minute. This means, the larger, less compact the head, the less water pressure you’ll receive. For woman with lots of hair, this can be an issue. You don’t want to spend an extra fifteen minutes in the shower every morning just rinsing the soap out of your luscious locks; ain’t nobody got time for that. Save the trickling waterfall action for men, or if you have the space for two fixtures, use both- a wall mount for hair and quick cleansing and a rain head fixture for everyday washing and gentle massaging. Besides the shower head, women have a few other needs to consider when designing the perfect shower. When shaving, you’ll need a place to prop your leg up. This can be done in the form of a bench seat, or if you have less room, a shallow ledge or foot hold. Bench seats will be about 20” high and 12-20” deep, while the ledge can be as little as 4-6” deep. Regardless of size, I would recommend selecting a solid surface material here for a more seamless look. Keep in mind, the less grout you have, the easier it is to keep clean! Place a handheld shower head near the bench to rinse yourself off. This is also a great tool when it comes to cleaning; spray down shower walls and nooks with ease! Which brings us to our next concept, the shampoo niche. The shampoo niche is a recessed pocket inside your shower where you can put your, you guessed it, shampoo. Try to situate the niche in an easily accessible place that doesn’t call out too much attention. You don’t want to break up the beautiful tile design on a prominent wall, and it’s hard to keep it tidy. this isn’t HGTV. Most of us have more than one glass bottle and a sea sponge keeping us going, let’s be real. 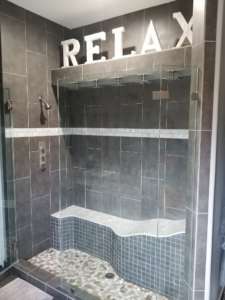 As with the shower, you have some options when it comes to the tub area as well. There are undermount or drop in tubs that will require a solid surface decking of some kind, and there are freestanding tubs. Most people these days are opting for the free-standing. These allow you to “float” the tub in the space and are much less cumbersome. However, with the free-standing tub, you are losing your storage ledge, so you’ll need to get creative if you actually plan on using the tub. A recessed wall niche, like we talked about for the shower, can be an awesome addition to house product, or even a small bench can be a great place to set a few items. (Be sure to think about towel hook or rod placement for all three of these areas). Tub plumbing fixtures come three ways- deck mount (for the under-mount tubs), wall mount and a floor mounted tub filler. 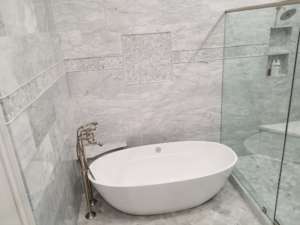 Keep in mind, if you’re remodeling an existing bath, moving the plumbing into the floor to accommodate a tub filler can be costly but it provides a very clean look. The tub surround, meaning the walls around the tub, need to be tiled to prevent damage from splashing. This can be done in a variety of materials, just make sure it covers at least the first 30” of wall. In regard to materials, be sure that your main flooring surface has some texture to it. This will decrease your chances of slipping when stepping freshly out of the tub or shower. Choose a smaller tile, either 1”x1” or 2”x2” for the shower floor to allow for ease of the drainage slopes. 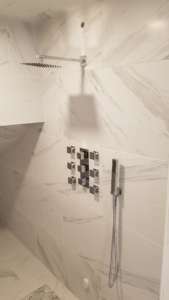 Larger scale tile, when done with a zero, or minimal grout line, can make the floor or walls feel almost as if they are one seamless slab of material. On the same note, if you have it in the budget, using a solid slab of material on walls can be an absolutely stunning backdrop. Just be sure the builder knows how to properly disperse the weight. Any natural, more porous materials will need to be sealed regularly. Softer products, like limestone or marble, that wouldn’t be acceptable in high traffic areas like the kitchen, are ok here. It’s very important to have a design expert help you with any tile designs you have in mind. These areas can be tricky to maneuver, and detailed CAD drawings will ensure the tile layer has all the information he needs to do it right the first time. Last but not least, think outside the box! Add a custom linen armoire with a built-in laundry hamper, or even a coffee bar. Some of our clients place a television in their master bath, where they can watch the news from the shower in the morning. Body sprays are a popular splurge in the master shower, just be sure to place them accordingly based on your body height and proportions. Or, opt to turn your entire shower into a sauna by adding a steam component. With everything else you have going on, spa trips are few and far between, so why not bring the spa to you? It’s great for resale, your mental health, and therefore everyone else around you’s well-being. Save a child, upgrade your bathroom! !